It’s Heroes vs. Villains – and how fitting is it that Mirambo is one of the evil Villains? 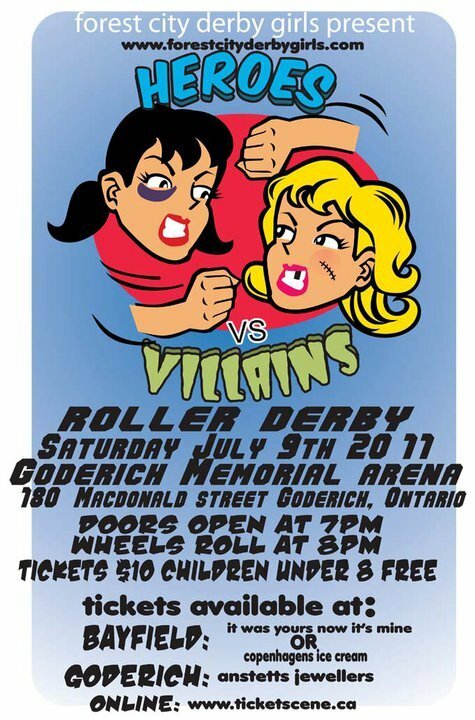 Hammer City Harlots take on Roc City [from Rochester, New York] at Dave Andreychuk Arena with doors opening at 6, have you seen the bout poster? or less experience or there has been a blending of leagues to form the sixteen teams who engage in a Beast of the East tournament format. All the games will be held concurrently at the two rinks of Ted Reeve Arena – with the semi-finals being played in the main arena. Twenty minutes playing time, double elimination knockout, 28 games in all. Starts at 11 a.m. Last game scheduled for 9 p.m. How much more fun can you have? This photographer will be one tired puppy at the end of it all. Forest City take off on Hammer, Eh! Well, we could not be at the Beast of the East, but going to Hammer City to their season opener doubleheader was not second best to say the least. By admission within their programme for the night, the Hammer City Rollergirls were going through rebuilding and “some realignment. 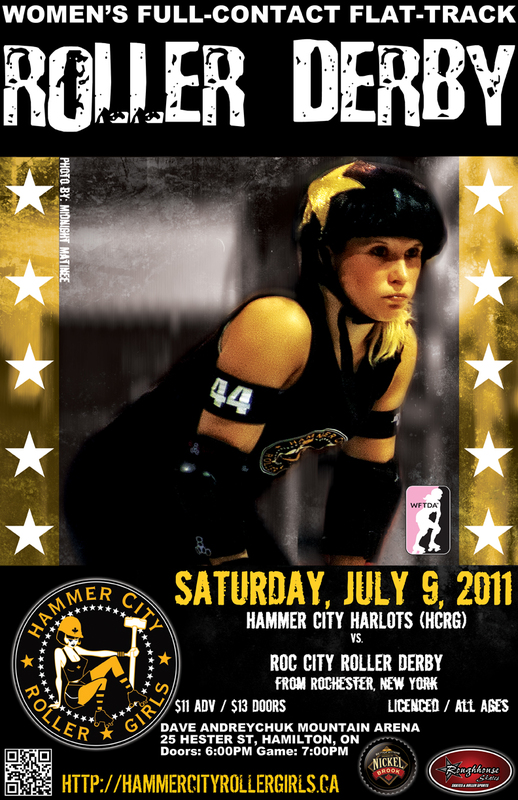 Under the new HCRG structure we have two fierce teams”, the regional Hammer City Harlots and the WFTDA Hammer City Eh! Team. The rematch between HCRG and Forest City brought back to mind the two matches from last year, both won by the Hammer, and one of which we were privy to watch at Thames Fatales’s Western Fair stage. The vaunted run and gun and take no prisoner style of Hammer City Eh! team at Quad City Chaos’s first year in 2010 was in full evidence against Thames, rekindling the memorable hits and memorable names at the Battle of the Waterfront (which took place on the hottest day of the year between Death Row Dames in blue and Harlots in red that with the most sudden of sunshowers brought the bout to a skidding stop). The battle with the Thames was the last we were to see of HCRG in 2010 where Perky Set and VicaDoom led the red of the Harlots over the Thames Fatales in forest green and black. HCRG, once the champions of Beast of the East in 2008, were missing at this year’s Beast and Quad City Chaos as HCRG as a league underwent a massive organizational change. 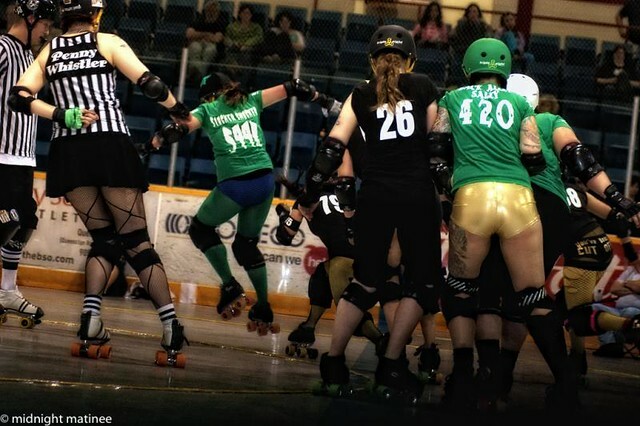 HCRG carry their Derby history through the Steeltown Tank Girls, Hamilton Harlots, Eh! Team, Death Row Dames. But for now it’s down to the two teams in the Hammer. 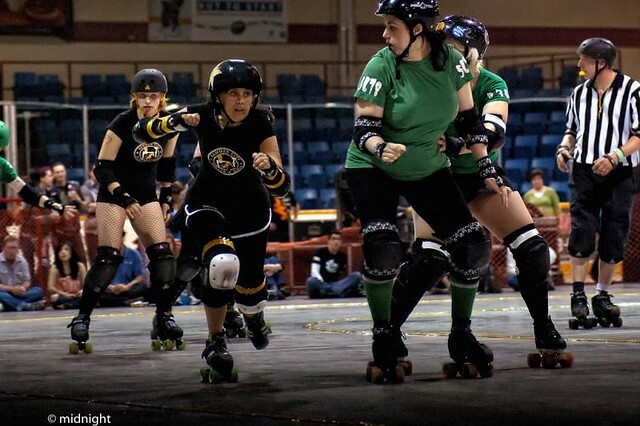 This piece is not intended to be another history of HCRG or Thames, but another chapter is being written, so to add to that story is our valued contributor: Lee Way Wreck’Em [incidentally the lead jammer with GTA Rollergirls Derby Debutantes] who witnessed the weekend. The first thing noticed was the massive changes in rosters. Forest City’s Thames Fatales were already without Sufferjet on the jammer line [although playing at Beast] in Hamilton and Piepshow was taking time off since November, but looking forward to a return at the end of May. As well, missing in action in more ways than one was CommieKaze. These were not the HCRG Eh! Team or Hamilton Harlots of days yore. This was a HCRG without the likes of Dicey or Dangermouse, Vicadoom or Carla Coma, ChainSaw Mary or Jett-Girl, Perky Set. Longtime vets Eduskating Rita and Bitchslap Barbie, Hawkeye Fierce and Miss Carriage are still on the Eh! Team, yet the league as a whole incorporated newer talents presenting new challenges in defending the name of the Hammer. It was probably Thames being battle toughened already in the season and Hammer playing in their first games of the season that gave Forest City an advantage. Thames Fatales had already launched their season by travelling down to Mid Michigan in a rematch of their bout from 2010. Then came two very tough losses at Beast of the East 2011 against eventual finalists Gore Gore Rollergirls and ultimate champions Slaughter Daughters. From the get-go in Hamilton, Thames showed themselves to be a high speed team in warm-up that continued onto the game. Thames Fatales have been around longer as an experienced unit, with their roster of ten led by the able veterans including C of 234 Anya Face and A of Mirambo #69 along with 420 Backalley Sally, 13 Dollface Massacre, 5678 Annie Takers amongst others pulled ahead. Both sides dealing with penalties and attendant problems, power jams and Thames trapping walls allowed points to accumulate. Without Piepshow or Tamahawk, the jamming core revelation of the Fatales was Slacker Smacker who practically rotated 1-2 with speedster Killson. Eventually, Jemecide got thrown into the action, too getting two jams, including last jam! There was no lack of will however on the track, the trademark Hammer style on display, Eduskating Rita still laying the big bombs on the track, captain Bitchslap Barbie, JJ Bladez and Miss Carriage on the jam and Lock N Roll’s go for broke takeout play. Down 39-63 at the start of the second half, Eh! Team woke up, playing more effectively in the second half, coming up with plays to stop the jamming invasion. Thames’ speed on the jam though negated that, with the presence of Killson. It was a toss-up between Killson and Slacker Smacker as to who was more effective from the jammer position. The first game of the night was the newlook Harlots wearing the Hammer black and white and gold. The Hammer City Harlots wearing the Hammer City Rollergirls logo tops of black [sans Harlots symbol or red!] squared off against the bright yellow and blue of Luscious Lunch Ladies, the more rookie laden team of the Forest City Derby Girls. The Luscious Lunch Ladies already had a handful of bouts to their name. 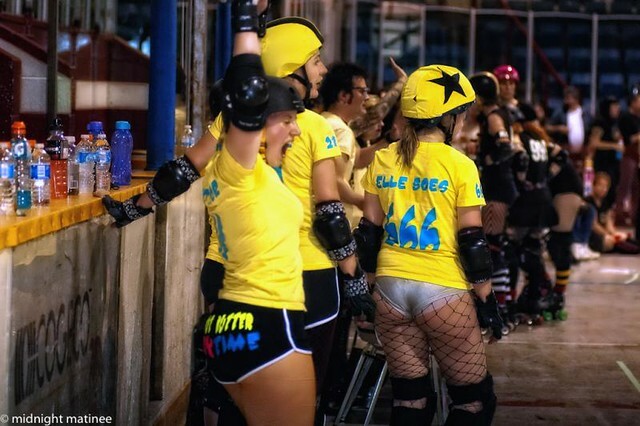 But added to their roster was the presence of 666 Elle Boes which gave the Ladies a major, almost unfair advantage because of her Derby background with the original London Thrashers, then the Thames Fatales. Coming out of inaction, it was decided to put her on the Luscious Lunch Ladies for the night to get some gametime in. The MVP of the night for the Lunch Ladies was Grisly Baire as chosen by the Harlots. The final 210-64 score in favour of the LLL signalled to all on the outside that this was a new Harlots in the making. It was not a night without casualty as #K9 Scooby Doom left the bout leaving with a shoulder injury. Hammer City coming on the short end of the score on both games does not belie the gritty efforts and hustle and heart of Luscious Lunch Ladies and Harlots, Thames Fatales and Eh! Team on the track and kudos to everyone who ran the show so the fans could see their favourite players in the Derby world. Andi Slamberg with the Luscious Lunch Ladies knew they had to step up their game to face the Hammer. Thames Fatales and Luscious Lunch Ladies in their development have shown they are going to be teams to look out for as they represent the Forest City Derby Girls. Lots of savvy and coaching.